After several years of working in remote tribal villages, it became obvious there was an absence of men. The newly planted churches were primarily women, as there were few men in the Transkei villages. In a male dominated culture, it was important to reach the men. The Xhosa young men would travel to the cities to work in the factories or in the mines, in order to earn enough money to return to the Transkei to buy a wife. But after obtaining a job and becoming consumers, the men were reluctant to return to their homelands. They remained in the ‘black townships’ of South Africa and would annually visit their homeland (and their wives). When the men visited their families and their villages they would view church as a women’s activity. During their times in their village they would choose to drink rather than go to church. In 1990, it was decided to begin outreaches to the more western Xhosa who were gainfully employed. This ministry was very different from the village ministries, as many of the westernized Xhosa would worship in a more contemporary style and wear more western clothes. They had shoes, watches, spendable income, and could read their own language. As a result of reaching the more westernized amaXhosa, a new ministry was soon developed to reach this group of amaXhosa. This new ministry was soon called African New Life Ministries (ANLM). 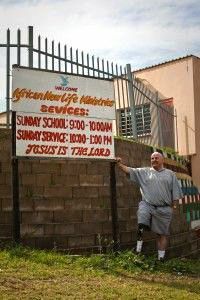 Over the last couple of decades, ANLM has planted many churches throughout the cities and townships of southern Africa. The main mission center for ANLM is located in Msobomvu. In addition to reaching the western amaXhosa, they have now begun to establish churches in the rural (not remote) areas of the Transkei.